New homes for sale in the Chester, Virginia area! Visit the Villas at Magnolia Lakes, or click here. Cornerstone Homes will celebrate the groundbreaking of their new models at The Villas at Magnolia Lakes on Wednesday, October 1st from 4 - 6 pm. There will be a ceremonial on-site groundbreaking prior to the Champagne Kick-Off in The Magnolia Club community clubhouse. Sales have been brisk since the opening of the Sales Office, and future residents are eagerly awaiting the beginning of construction. Excitement has been building for this unique, active lifestyle community. Located in Chester, The Villas at Magnolia Lakes features single-story homes with resort-like amenities for the dynamic lifestyle that today's empty nesters and retirees seek. Designed as a cohesive, close-knit community, Magnolia Lakes fosters a sense of freedom by minimizing the burdens of homeownership, while encouraging relaxation, recreation and travel! 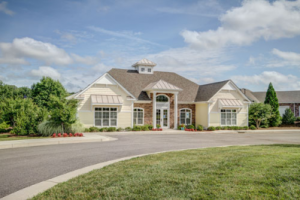 The active adult market is the fastest growing segment of homebuyers, and Cornerstone specializes in creating new homes and communities that meet their demands. The Villas at Magnolia Lakes features an active lifestyle emphasizing health and wellness, fun, family and friends, as well as smart, energy efficient homes, with incredible community amenities. The community is surrounded by a lake that will have a pavilion and boardwalks, as well as walking trails, and a clubhouse complete with a kitchen, a fitness center and an indoor/outdoor fireplace. With its convenient location near I-95 and Route 288, residents can be in Richmond in no time. Current Magnolia Lakes residents are thrilled that they will soon have new neighbors joining their close-knit community. Current resident Ed Newman says the key reasons he chose Magnolia Lakes were the convenience, ease of living, and the opportunity to be active. "We are a very active group. We'll catch movies, go to plays, and host a party on holidays," says Mr. Newman. "There's a group of 10-15 women who have lunch once a month, while a group of 10-15 men meet for breakfast once a month. It's a great opportunity to get together with friends and have a good ol' time." Mr. Newman says he wishes he'd made the move to Magnolia Lakes even sooner! Founded in 1998 by Roger A. Glover, Cornerstone Homes exclusively builds active adult communities, constructing more than 1,000 homes in communities across Virginia, North Carolina, Tennessee and Louisiana. With its entry into the Richmond housing market, the company has staked its claim as the ONLY builder in Richmond exclusively building active adult communities. Cornerstone Homes is headquartered in Richmond, and is known for its commitment to quality, service, value and customer satisfaction. For more information about Cornerstone Homes or The Villas at Magnolia Lakes, visit cornerstonehomes.net/richmond-va/. For more information about the Groundbreaking, contact Dotti Houlihan at 804-335-8510.